The judgment in the case of Shanti Bhushan v. Union of India (2007), when seen in light of Katju’s allegations, raises questions over the involvement of former Supreme Court Judge Markandey Katju in the controversy. The allegations were debated in this 6 year old case. Six years ago, the Supreme Court was derisive in its condemnation of former Chief Justice R.C. Lahoti for yielding to the judiciary’s primacy and “swaying to the UPA government’s view” in 2005 to grant extension of service to a Madras high court judge, referred as “corrupt” by Katju. Read the allegations and the post here. It was alleged in the case that “required norms” weren’t followed while appointing him as a permanent Judge, such appointment being in violation of the law as declared by the Court in the cases of Supreme Court Advocates-on-Record Association & Ors. v. Union of India and Special reference No.1 of 1998. It is hence necessary to first understand the procedure of reappointment of an Additional Judge as a permanent Judge. In S.P. Gupta v. Union of India, the Court observed that when the term of an Additional Judge expires he ceases to be a Judge and therefore, if he is to continue as a Judge, he must be either reappointed as an Additional Judge or appointed as a permanent Judge. In either case, clause (1) of Article 217 would operate and no reappointment as an Additional Judge or appointment as a permanent Judge can be made without going through the procedure set out in Article 217(1). The name of the Additional Judge would have to go through the procedure of clause (1) of Article 217 and after consultation with the Chief Justice of India, the Governor of the State and the Chief Justice of the High Court, the Central Government would have to decide whether or not to reappoint him as an Additional Judge or to appoint him as a permanent Judge. The Chief Justice while sending the recommendation for appointing an additional Judge as a permanent Judge must along with his recommendation furnish statistics of month wise disposal of cases and judgments rendered by the Judge concerned as well as the number of cases reported in the Law Journal duly certified by him. The information would also be furnished regarding the total number of working days, the number of days he actually attended the Court and the days of his absence from the Court during the period for which the disposal statistics are sent. The Court in Shanti Bhushan case observed that the rigor of the scrutiny and the process of selection initially as an Additional Judge and a Permanent Judge are not different. The judgment however, notes certain differences between the two appointments. It states that while making the recommendations for appointment of an Additional Judge as a permanent Judge, Chief Justice of the High Court is not required to consult the collegium of the High Court. Additionally, there is no requirement of enquiry by the Intelligence Bureau. The Chief Justice while sending his recommendation has to furnish statistics of month-wise disposal of cases and judgments rendered by a Judge concerned as well as the number of cases reported in the Law Journals duly certified by him. Additionally, at the stage of appointment of either as an Additional Judge or a Permanent Judge, the Union Minister of Law, Justice and Company Affairs is required to consider the recommendation in the light of such other reports as may be available to the Government in respect of the names under consideration. The complete material would then be forwarded to the Chief Justice of India for his advice. This procedure is not required to be followed when an Additional Judge is appointed as a Permanent Judge. The Judge in question, Justice Kumar's scrutiny took place before April 2003 during the term of CJI Khare. The Shanti Bhushan judgment reveals the practice that High Court CJs send statistical data on an additional judge's performance. Reports available to the government which bear "adversely on the mental and physical capacity, character and integrity or other matters in the appointment of a permanent judge" are also sent. Over the years this was not done; or done improperly.” The reasons for this fall-out haven’t been mentioned. Justice Katju had stated in his post it was he who had brought the corruption complaints against the judge in question which prompted Justice Lahoti to initiate an IB inquiry. But the judgment said, "It is to be noted that at different points of time, starting from the point of initial appointment (in 2003), successive chief justices have recommended for Justice Kumar to be made permanent. That situation continued till February 3, 2007, when the recommendation of then chief justice of Madras HC for appointing Justice Kumar as a permanent judge was accepted." The judgment states that it was on 3.2.2007 that the CJI accepted recommendation of the then Chief Justice of the Madras High Court for appointing the allegedly ‘corrupt’ judge as a Permanent Judge. The CJI then had the recommendation of the then Chief Justice of Madras High Court who re-iterated the view of his predecessor in this regard. At that point of time, the Chief Justice of Madras High Court was Justice A.P. Shah and before him, the post was occupied by Justice Markandey Katju. Justice Katju was the chief justice of Madras HC from November 28, 2004 till October 10, 2005. It was during his term as Chief Justice that the question of making Justice Kumar came up for consideration before the collegium headed by then CJI R.C. Lahoti. According to Rajeev Dhavan, CJI Lahoti seems to have consulted the collegium and replied Kumar's name be segregated, but allowed him to remain additional judge. This solution was perfect as it suited the CJI's dilemma; and the government's concerns about jeopardizing the coalition. 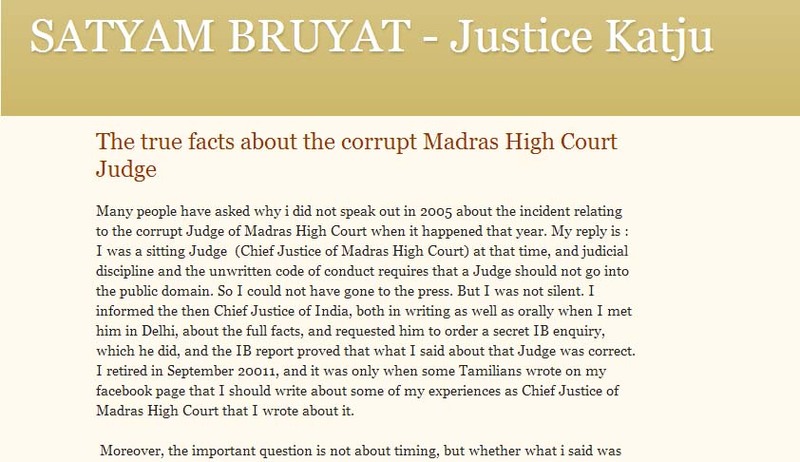 If Justice Markandey Katju was in fact concerned about the credentials of the "corrupt" Judge continuing in Madras high court, his silence during that period does raise a lot of questions. Read jurists views about the controversy here.